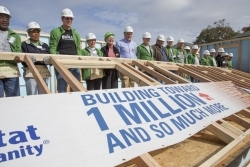 ATLANTA (Nov. 6, 2013) — Today, supporters and Habitat for Humanity global leaders raised the walls on the 800,000th home the organization has built, rehabilitated or repaired around the world since its founding in 1976. The home is being built by Atlanta Habitat for Humanity. With an average of five people per Habitat home, this milestone house represents an estimated 4 million people who have improved their living conditions through Habitat’s housing solutions in the more than 70 countries around the world where Habitat works. In its 2013 fiscal year, Habitat for Humanity built, renovated or repaired 124,946 homes, marking the first time that Habitat served more than 100,000 families in a single year, significantly surpassing the previous record in 2012 of 94,618 families served. This equates to a family being served on average every 4 minutes. In addition to housing construction efforts in 2013, Habitat for Humanity provided 214,244 individuals with technical assistance, such as financial literacy education and construction training. Habitat for Humanity International’s vision is a world where everyone has a decent place to live. Anchored by the conviction that housing provides a critical foundation for breaking the cycle of poverty, Habitat has helped more than 4 million people construct, rehabilitate or preserve homes since 1976. Habitat also advocates to improve access to decent and affordable shelter and supports a variety of funding models that enable families with limited resources to make needed improvements on their homes as their time and resources allow. As a nonprofit Christian housing organization, Habitat works in more than 70 countries and welcomes people of all races, religions and nationalities to partner in its mission. To learn more, donate or volunteer, visit habitat.org. Atlanta Habitat for Humanity, one of more than 1,500 U.S. affiliates of Habitat for Humanity International, is a nonprofit organization dedicated to homeownership for working families. Since 1983, volunteers from corporations, from faith-based and civic organizations have worked in partnership with qualified homebuyers to construct affordable, green, quality homes, which are purchased through no-interest mortgages. To date, Atlanta Habitat has built nearly 1,300 homes in the city of Atlanta and Fulton County. For more information, please visit www.atlantahabitat.org or call 404-223-5180.